1. The undecideds will ALL break for McCain. This theory is based on the idea that McCain has somehow turned Obama into the incumbent (dubious), or, more plausibly, not a Bradley factor exactly (people telling pollsters they are voting for Obama but won't), but the idea that the black candidate needs 50% or more to win (meaning that undecideds are really decided AGAINST the black candidate). 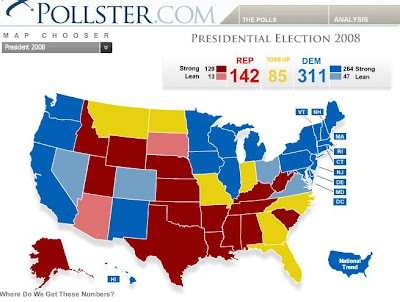 Since Obama is just under 50% in some key battlegrounds, the undecideds could be masking what is really a much closer race. 2. Republican shananegans with voter suppression and vote stealing could tip the election in key states. 3. States like Virginia, which Politico show as leaning Obama, are now too close to call. Obama can win without VA, but if these other factors come into play, could Ohio also tip McCain's way, and Pennsylvania? Doubt upon doubt. 1. Polls show that McCain's attacks have had little influence on voters. Palin is keeping it up, probably doing more to drive away independents than to rally the base. 2. Experts say polls are undercounting cell-phone users favoring Obama. 3. Even the FOX poll is giving Obama a steady seven-point lead. 4. Let's just look at the difficulty of McCain's task. EVEN IF he wins all the swing states by getting 90% of undecided voters, McCain THEN ALSO has to win BOTH Virginia and Ohio (lean Obama states where his support is just under 50%). And that STILL won't win it for him (that still gives Obama 278). McCain would have to go into solid Obama territory and reverse Obama's already decided support in at least one major state to ALSO take away either Colorado (where Obama is averaging about 50.8% support and 5.5% over McCain) or Pennsylvania (where Obama is averaging about 51.3% support and 7.6% over McCain). The McCain camp obviously thought they couldn't achieve this task in Colorado so they focused on PA; but polls indicate the task isn't any easier in Pennsylvania. In the end, Democrats can't believe they are in a position to win. They are so used to having victory snatched away at the last minute. Republicans can't believe they are in a position to lose. They are so used being able to bully their way to a narrow win. My take? I think due to the undecideds factor, Obama could very well lose all the "swing states,"
with Florida ending up too close to call. I think, however, he has a goog chance to hold on to the Politico "lean Obama" states. Fortunately, that would still make him President, with 311 electoral votes. However, there is surely one thing you can say about tomorrow. No matter who wins, the travesty of the George W. Bush years (though, if McCain wins, not the politics) will finally see its epilogue.